Greg with group approaching the Mineral Gulch property of Western Pacific. The mountain in the picture is where we are heading. You can see the open-pit workings in the mountain. 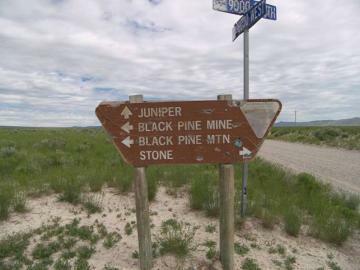 Sign post on the way to the project. 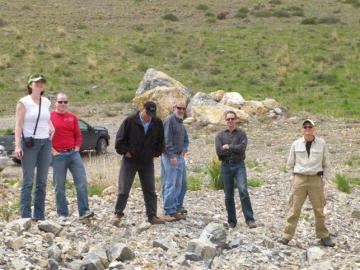 Group photo at the Mineral Gulch site. Open-pit mine that was built in the 1990's. 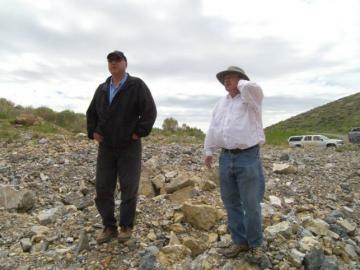 The area holds plenty of potential for further discovery of gold. 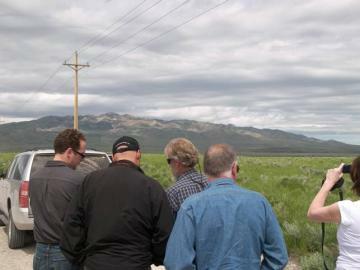 Getting the overview on the geology and history of the old mine. 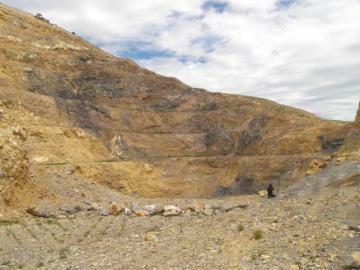 The mine produced over half a million ounces of gold but was shut down due to low gold prices in the mid 1990's. Greg with Dave Leishman (broker from Canaccord Capital) in a discussion about the potential for the area. 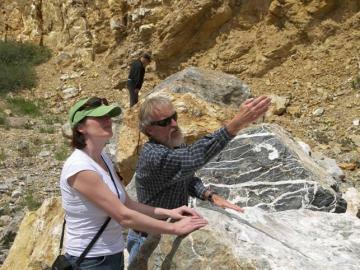 Chief geologist for Western Pacific explaining the structural geology of the existing open-pit mine. 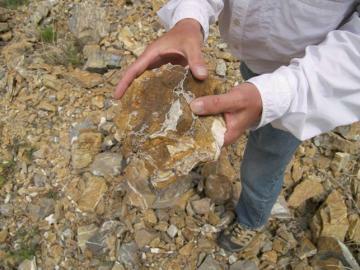 Piece of fractured rock that hold the gold values. 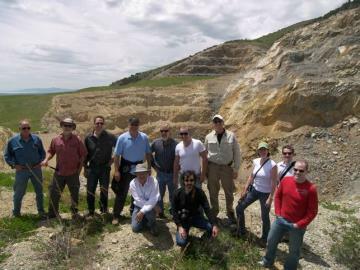 Group photo at the Mineral Gulch open-pit mine in Idaho. 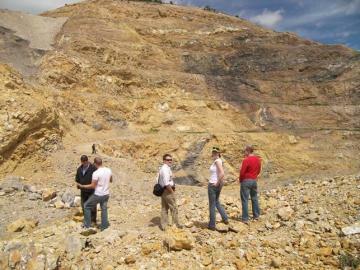 Picture of the bottom of the open-pit where the old mine stopped production. 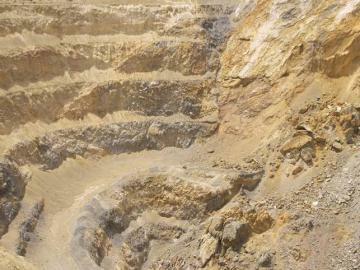 This open-pit could continue to produce gold if prices were over $1,000 an ounce. Greg standing next to the tires of the huge hauling trucks at Barrick Gold's Pipeline Gold Mine in Nevada. 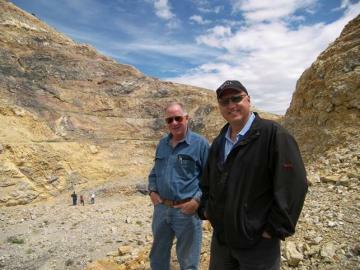 "When I first met you, you told me I could use the profits I would make in the mining stocks to pay off my house. I didn’t really believe you. Two and half years later I wrote a check to do just that. I never thought this would be possible. Thank you so much for your wise guidance." The Insider Alert, The Mining Speculator, The Special Situations Report, and The U3O8 Report, Copyright © 2019, Discovery Publishing LLC. 2226 W. Northern Ave., C140, Phoenix, AZ 85021. For Customer Service, please call 1-800 610-0183 or 602-445-2763. All rights reserved. No statement or expression of opinion, or any other matter herein, directly or indirectly, is an offer or the solicitation of an offer to buy or sell the securities or financial instruments mentioned. Discovery Publishing, Greg McCoach, The Insider Alert, The Mining Speculator, The Special Situations Report, and The U3O8 Report does not provide individual investment counseling, act as an investment advisor, or individually advocate the purchase or sale of any security or investment. Subscribers should not view these publications as offering personalized legal or investment counseling. Investments recommended in these publications should be made only after consulting with your investment advisor and only after reviewing the prospectus or financial statements of the company in question. These letters are not intended to meet your specific individual investment needs and it is not tailored to your personal financial situation. Nothing contained herein constitutes, is intended, or deemed to be – either implied or otherwise – investment advice. Neither the publisher nor the editors are registered investment advisors. These letters reflect the personal views and opinions of Greg McCoach and that is all it purports to be. While the information herein is believed to be accurate and reliable it is not guaranteed or implied to be so. Neither Greg McCoach, nor anyone else, accepts any responsibility, or assumes any liability, whatsoever, for any direct, indirect or consequential loss arising from the use of the information in these letters. The information contained herein is subject to change without notice, may become outdated and may not be updated. Greg McCoach, entities that he controls, family, friends, employees, associates, and others may have positions in securities mentioned, or discussed, in these letters. No part of these letters/articles may be reproduced, copied, emailed, faxed, or distributed (in any form) without the express written permission of Greg McCoach or Discovery Publishing. Unauthorized reproduction of these newsletters or its contents by Xerography, facsimile, or any other means is illegal and punishable by law.